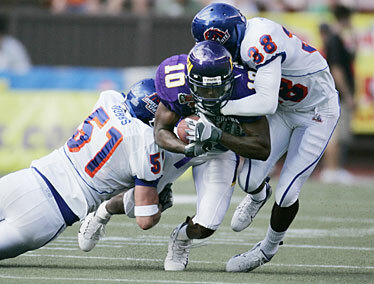 East Carolina's Jamar Bryant was tackled by Boise State's Dallas Dobbs, left, and Brandyn Thompson on Sunday. East Carolina is the perfect example of why records don't matter in bowl games. On paper, the Pirates were a 7-5 team that finished second in the Conference USA Eastern division. Compared to the 10-2 regular season mark for the Broncos, it seemed East Carolina was the inferior team. That proved to be far from the truth during Sunday's Hawaii Bowl, where the Pirates manhandled the Broncos in the first half and then came through in the clutch like a team that had been in those situations before. The Pirates played four non conference games against BCS teams and finished 1-3. But that experience allowed the Pirates to play, and finish, the way they did. "Even though we may not be able to be 11-1 playing those games, I think those games have really helped catapult our confidence level when we can line up and play with top-10 teams in the country," East Carolina coach Skip Holtz said. Hawaii was the only team with a winning record Boise State played in the last two months and none of the Broncos players were using the long layoff or vacationing in Hawaii as excuses after the game. QB Patrick Pinkney and East Carolina held off Boise State to win the Hawaii Bowl on Sunday. A pattern is beginning to develop in the Sheraton Hawaii Bowl. Somebody always has a monster game. East Carolina running back Chris Johnson became the latest player to rewrite the record books in the Hawaii Bowl, setting an NCAA bowl record with 408 all-purpose yards. "What the rest of the country saw (Sunday) is what we have been watching the last three years," East Carolina coach Skip Holtz said. A year ago, it was Hawaii wideout Jason Rivers who set an NCAA mark for receiving yards in a bowl game with 308 in a 41-24 victory over Arizona State. 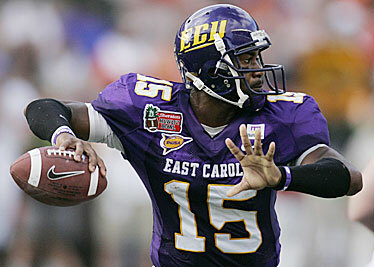 That came on the heels of a 210-yard, three-touchdown performance by Central Florida's Brandon Marshall in '05. In the six-year history of the Hawaii Bowl, the game has had five 150-plus receiving performances, seven 100-yard rushers and six quarterbacks with at least 300 yards passing. Hawaii Bowl executive director Jim Donovan says that the warm weather and the fast FieldTurf play a part in the annual excitement. "Six hawaii Bowl games and every single one has been exciting," Donovan said. What made Johnson's performance arguably the greatest of them all was his ability to dominate in every facet of the game. He returned every Broncos kickoff in the game, six in all, for 153 yards. When the Pirates trailed for the first time in the game at 7-3 in the first quarter, the 5-foot-11, 195-pound Johnson took the ball on the first play of a drive 68 yards for a touchdown. He even showcased his skills as a receiver, hauling in a screen pass near the 20-yard line and racing past the Broncos defense untouched into the end zone. "We made him look pretty good tonight," Broncos safety Marty Tadman said. So have a lot of teams. He finished the season tops in the country with 2,960 all-purpose yards. He had more than 1,400 yards rushing, 500 receiving and 1,000 return yards. "We've asked a lot of him this year," Holtz said. "He carries the ball 30 times and comes to practice the next day and won't miss a beat. He's a warrior." To say it has been a breakout season is quite an understatement. In '06, Johnson played in all 12 games, but averaged less than 30 rushing yards a contest. His 176 receiving yards were the worst of his four-year career and he scored just five times. "I think this is the first year he had an opportunity to be behind an offensive line that merits him doing the type of things that his talents can do," Holtz said. His performance nearly was all for naught. The Pirates needed just one first down to run out the clock, but on his 236th carry of the season, he fumbled for just the second time, allowing the Broncos to tie it at 38. After the game, Johnson didn't say much, but was thankful his team let him off the hook for his mistake that nearly cost the Pirates the game. "The last game of the season went well for me," he said about his performance.